Nearly two decades into the coffee renaissance in North America, it is reassuring to find that this popular beverage might protect us against an alarmingly common contemporary malady—type 2 diabetes, a disease affecting at least 171 million people worldwide and causing enormous economic, health, and social costs. A new analysis of previous research concluded that drinking coffee, as well as decaffeinated coffee and black tea, was associated with a reduced risk of developing type 2 diabetes. People who drank three to four cups of coffee per day had an approximate 25% lower risk of diabetes than people who drank no coffee or fewer than two cups per day. Every additional cup of coffee per day was associated with an additional 7% reduction in risk. Decaf drinkers taking 3 to 4 cups of decaf per day had a 36% lower risk of diabetes compared with people who did not drink any. 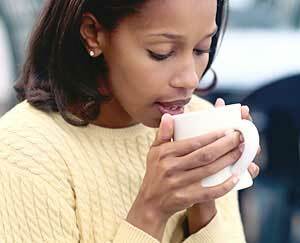 Tea drinkers consuming 3 to 4 cups of tea per day had an 18% lower risk of diabetes compared to non-tea drinkers. Health concerns about coffee drinking are most often related to its caffeine content. Caffeine can temporarily increase heart rate and blood pressure, cause irritability and insomnia, and trigger irregular heart rhythms in some people. There is also evidence that women who drink caffeinated beverages might have a harder time achieving and maintaining pregnancy. On the other hand, research suggests that coffee drinkers might be at lower risk of developing gallstones, colon cancer, Alzheimer’s disease, and Parkinson’s disease. It may also prevent liver damage in people at high risk of liver disease. “Our findings suggest that any protective effects of coffee and tea [against diabetes] are unlikely to be solely effects of caffeine but rather, as has been speculated previously, they likely involve a broader range of chemical constituents present in these beverages, such as magnesium, lignans, and chlorogenic acids,” the authors of the current report noted in their conclusion. Limit intake of simple sugars, especially high fructose corn syrup. Overconsumption of sugar and refined grains, like white flour products, raise blood glucose levels and over time contribute to reduced insulin sensitivity and poor blood glucose control. Eat plenty of fruits, vegetables, whole grains, and nuts and seeds, as well as cold-water fish, like salmon and tuna. These foods help keep blood sugar stable and support a healthy cellular response to insulin over the long term. Engage in physical activity every day. The current recommendation is least 30 minutes of moderately vigorous activity four times per week, and more is even better.